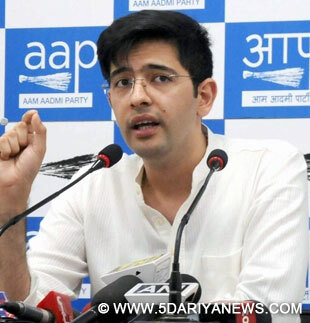 If it is voted to power, the AAP said on Monday it will order a probe into all the assets raised by the families of Chief Minister Parkash Singh Badal and Deputy Chief Minister Sukhbir Singh Badal during the 10-year rule of Punjab.AAP leader Raghav Chaddha told the media here that an AAP "government would probe all the assets raised by the Badal family during their 10-year rule and make them face the law".Chaddha and other Aam Aadmi Party leaders and volunteers on Monday staged a protest near 'Sukhvilas', a luxury resort set up by the Badal family and managed by the Oberoi Group. They demanded a probe into the sources of money spent on constructing the hi-end resort, located in Palanpur village in Punjab, 12 km from here.Aam Aadmi Party dialogue committee chairman Kanwar Sandhu termed the luxury resort as a 'loot mehal', alleging that it was constructed "with the money looted from the people of Punjab"
.While the state had been facing economic crunch due to financial mismanagement, the Badal family had multiplied their wealth and left the poor people in the lurch, Sandhu said. "The AAP government will confiscate the 'Lutt Vilas' resort. "He alleged that people, especially farmers, living in villages near the resort "were forced to sell their land by the revenue authorities working under political influence". "Rs 29 crore from public exchequer was misused to construct a road that leads to resort. Sukhbir Badal had also made the layout of roads in Mohali to give direct access from Mohali airport to his resort," Sandhu said.Sandhu said Sukhbir Badal managed to involve the Oberoi Group to own the resort in which he (Sukhbir) and his wife and union minister Harsimrat Kaur Badal have majority stakes. "The one night fare of a villa in Sukhbir's resort is Rs 5 lakh and a room is available for Rs 35,000 per night. Such a luxury was not meant for the people of Punjab," he pointed out. AAP leader Jassi Jasraj said: "While farmers all over Punjab were committing suicide, unemployed educated youth is climbing on water tanks for jobs and forced to commit self-immolation, teachers are hounded by police, Sukhbir Badal was busy building his luxury resort. "Sukhbir had promised the moon to the people of Punjab and completely ruined their future with drugs. The Badal family and Bikram Majithia have promoted and shielded drug and mining mafia in the state. "Lawyer and AAP leader Dinesh Chaddha said the resort was set up in the Siswan forest range in violation of environment and forest rules.He said the National Green Tribunal had already issued notice to the Punjab government to explain about the permissions granted for setting up the resort in the forest area. "The AAP government will not allow the resort to function as it is a threat to environment and forestry," he said.The AAP leaders also said that the Badal family had usurped the state's transport business and their fleet was thriving at the cost of the state public transport.